So I have this problem. My elbows are always so dry, they start to peel and catch on my shirt sleeves. Kind of gross, I know -- but, no matter what I try, the dryness doesn't disappear. Well, until I discovered the amazingness that is First Aid Beauty Ultra Repair Cream, that is. A week of faithful application on my elbows and they're softer than they've been in YEARS. No more redness, no more scaliness, just a smooth expanse that I'm no longer embarrassed to show off. This is due to a blend of colloidal oatmeal, shea butter, eucalyptus oil and ceramides, which work to help everything from atopic dermatitis to irritant eczema. It's really no surprise that my elbows are back to normal! 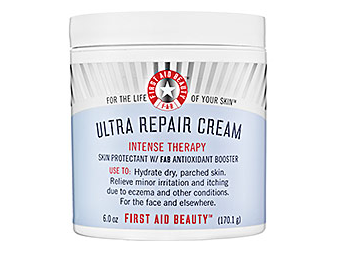 First Aid Beauty Ultra Repair Cream retails for $28 at sephora.com. A must try! I will surely recommend this to a friend.